Although you might blame kids, work, lack of sleep and long commutes, gray hair actually occurs naturally with age. You might notice a few grays along your hairline that quickly spread as the years go by. Instead of reaching for a box of permanent hair dye or visiting the salon, try a natural remedy to slowly darken your hair overtime: potato peels. 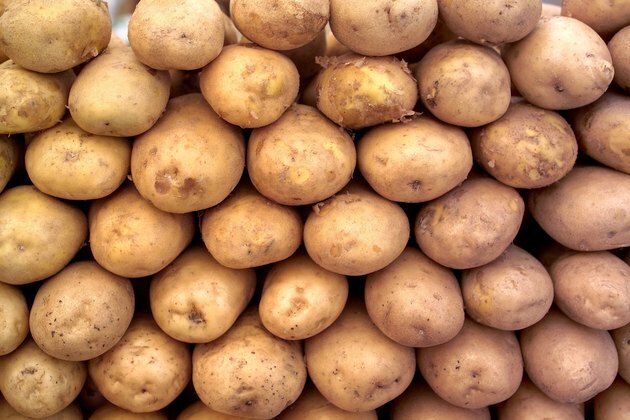 The starch in potato peels acts as a natural colorant that helps slowly cover your grays over a matter of weeks or months. Remove the peels for five or six medium to large potatoes. Set the flesh aside and place the peels inside a large cooking pot. Fill the pot with 1/2 gallon water. Bring the water to a rolling boil over high heat. Allow the peels to boil for 20 to 30 minutes. Pour the potato peels through a colander over a large bowl. Save the water and toss out the potato peels. Allow the potato peel-infused water to cool completely before pouring it into an old, clean shampoo bottle. Wash and condition your hair with moisturizing products. Because gray hair is drier and more brittle, it's important to nourish your tresses with extra moisture. Allow the conditioner to sit for one to two minutes before rinsing it out. Pour the potato peel water over your hair in the shower, and do not rinse it out. Emerge from the shower and towel dry and style your hair as usual. Repeat pouring the potato-peel infused water over your washed and conditioned hair daily, or two to three times per week if it's more convenient, for several weeks or months, or until you're happy with the results. Scientific American: Why Does Hair Turn Gray? What Are the Treatments for a Sunburned Scalp?